Bannister, Peter (2013). “Olivier Messiaen (1908–1992)”. In Anderson, Christopher S. Twentieth-century organ music. New York: Routledge. ISBN 9781136497902. Benitez, Vincent P (2008). Olivier Messiaen: A Research and Information Guide. New York and London: Routledge. ISBN 0-415-97372-4. Bruhn, Siglind (2008). Messiaen's Interpretations of Holiness and Trinity. Echoes of Medieval Theology in the Oratorio, Organ Meditations, and Opera. Hillsdale, NY: Pendragon Press. ISBN 978-1-57647-139-5. Dingle, Christopher (2007). The Life of Messiaen. Cambridge & New York: Cambridge University Press. ISBN 0-521-63547-0. Dingle, Christopher (2013). Messiaen's final works. Burlington, VT: Ashgate. ISBN 9780754606338. Dingle, Christopher, & Nigel Simeone (eds) (2007). Olivier Messiaen: Music, Art and Literature. Aldershot: Ashgate. ISBN 0-7546-5297-1. Gillock, Jon (2009). Performing Messiaen's Organ Music: 66 Masterclasses. Bloomington, Indiana: Indiana University Press. ISBN 978-0-253-35373-3. Griffiths, Paul (1985). Olivier Messiaen and the Music of Time. Ithaca, New York: Cornell University Press. ISBN 0-8014-1813-5. Heller, Karin (2010). “Olivier Messiaen and Cardinal Jean-Marie Lustiger”. In Shenton, Andrew. Messiaen the theologian. Farnham: Ashgate. ISBN 9780754666400. Hill, Peter, ed (1995). The Messiaen Companion. London: Faber and Faber. ISBN 0-571-17033-1. Hill, Peter, and Nigel Simeone (2005). Messiaen. New Haven and London: Yale University Press. ISBN 0-300-10907-5. Hill, Peter, and Nigel Simeone (eds) (2007). Olivier Messiaen: oiseaux exotiques. Aldershot: Ashgate. ISBN 9780754656302. Kraft, David (2013). Birdsong in the Music of Olivier Messiaen. London: Arosa Press. ISBN 978-1477517796. Matossian, Nouritza (1986). Xenakis. London: Kahn and Averill. ISBN 1-871082-17-X. Pople, Anthony (1998). Messiaen: Quatuor pour la fin du temps. Cambridge: Cambridge University Press. ISBN 9780521585385. Rischin, Rebecca (2003). For the End of Time: The Story of the Messiaen Quartet. Ithaca, N.Y.: Cornell University Press. ISBN 0-8014-4136-6. Samuel, Claude (tr. E. Thomas Glasow) (1994). Olivier Messiaen: Music and Color: Conversations with Claude Samuel. Portland, Oregon: Amadeus Press. ISBN 0-931340-67-5. Shenton, Andrew (2008). Olivier Messiaen's System of Signs: Notes towards Understanding his Music. Aldershot: Ashgate. ISBN 978-0-7546-6168-9. Shenton, Andrew (2010). Messiaen the Theologian. Aldershot: Ashgate. ISBN 978-0-7546-6640-0. Sherlaw Johnson, Robert (1975). Messiaen. Berkeley and Los Angeles: University of California Press. ISBN 0-520-02812-0. Sherlaw Johnson, Robert (1989). Messiaen. Berkeley: University of California Press. ISBN 9780520067349. Simeone, Nigel (2009). “'Un oeuvre simple, solennelle...'”. In Shenton, Andrew. Messiaen the theologian. Farnham: Ashgate. ISBN 9780754666400. Baggech, Melody Ann (1998). An English Translation of Olivier Messiaen's "Traite de Rythme, de Couleur, et d'Ornithologie". Norman: The University of Oklahoma. Barker, Thomas (2012). "The Social and Aesthetic Situation of Olivier Messiaen's Religious Music: Turangalîla Symphonie." International Review of the Aesthetics and Sociology of Music 43/1:53–70. Benitez, Vincent P. (2001). "Pitch Organization and Dramatic Design in Saint François d’Assise of Olivier Messiaen." PhD diss., Bloomington: Indiana University. Benitez, Vincent P. (2004). "Aspects of Harmony in Messiaen's Later Music: An Examination of the Chords of Transposed Inversions on the Same Bass Note." Journal of Musicological Research 23, no. 2: 187–226. Benitez, Vincent P. (2004). "Narrating Saint Francis's Spiritual Journey: Referential Pitch Structures and Symbolic Images in Olivier Messiaen's Saint François d'Assise." In Poznan Studies on Opera, edited by Maciej Jablonski, 363–411. Benitez, Vincent P. (2008). “Messiaen as Improviser.” Dutch Journal of Music Theory 13, no. 2 (May 2008): 129–44. Benitez, Vincent P. (2009). “Reconsidering Messiaen as Serialist.” Music Analysis 28, nos. 2–3 (2009): 267–99 (published April 21, 2011). Benitez, Vincent P. (2010). "Messiaen and Aquinas." In Messiaen the Theologian, edited by Andrew Shenton, 101–26. Aldershot: Ashgate. Boivin, Jean (1993). "La Classe de Messiaen: Historique, reconstitution, impact". Ph.D. diss. Montreal: Ecole Polytechnique, Montreal. Boswell-Kurc, Lilise (2001). "Olivier Messiaen's Religious War-Time Works and Their Controversial Reception in France (1941–1946) ". Ph.D. diss. New York: New York University. Bruhn, Siglind (2007). Messiaen's Contemplations of Covenant and Incarnation: Musical Symbols of Faith in the Two Great Piano Cycles of the 1940s. Hillsdale, NY: Pendragon Press. ISBN 978-1-57647-129-6. Cheong Wai-Ling (2003). "Messiaen's Chord Tables: Ordering the Disordered". Tempo 57, no. 226 (October): 2–10. Cheong Wai-Ling (2008). "Neumes and Greek Rhythms: The Breakthrough in Messiaen's Birdsong". Acta Musicologica 80, no. 1:1–32. Dingle, Christopher (2013). Messiaen's Final Works. Farnham, UK: Ashgate. ISBN 9780754606338. Fallon, Robert Joseph (2005). "Messiaen's Mimesis: The Language and Culture of The Bird Styles". Ph.D. diss. Berkeley: University of California, Berkeley. Fallon, Robert (2008). "Birds, Beasts, and Bombs in Messiaen's Cold War Mass". The Journal of Musicology 26, no. 2 (Spring): 175–204. Festa, Paul (2008). Oh My God: Messiaen in the Ear of the Unbeliever. San Francisco: Bar Nothing Books. Goléa, Antoine (1960). Rencontres avec Olivier Messiaen. Paris: Julliard. Hardink, Jason M. (2007). "Messiaen and Plainchant". D.M.A. diss. Houston: Rice University. Harris, Joseph Edward (2004). "Musique coloree: Synesthetic Correspondence in the Works of Olivier Messiaen". Ph.D. diss. Ames: The University of Iowa. Hill, Matthew Richard (1995). "Messiaen's Regard du silence as an Expression of Catholic Faith". D.M.A. diss. Madison: The University of Wisconsin, Madison. Laycock, Gary Eng Yeow (2010). "Re-evaluating Olivier Messiaen's Musical Language from 1917 to 1935". Ph.D. diss. Bloomington: Indiana University, 2010. McGinnis, Margaret Elizabeth (2003). "Playing the Fields: Messiaen, Music, and the Extramusical". Ph.D. diss. Chapel Hill: The University of North Carolina at Chapel Hill. Ngim, Alan Gerald (1997). "Olivier Messiaen as a Pianist: A Study of Tempo and Rhythm Based on His Recordings of Visions de l'amen". D.M.A. diss. Coral Gables: University of Miami. Reverdy, Michèle (1988). L'Œuvre pour orchestre d'Olivier Messiaen. Paris: Alphonse Leduc. ISBN 2-85689-038-5. Schultz, Rob (2008). "Melodic Contour and Nonretrogradable Structure in the Birdsong of Olivier Messiaen". Music Theory Spectrum 30, no. 1 (Spring): 89–137. Shenton, Andrew David James (1998). "The Unspoken Word: Olivier Messiaen's 'langage communicable'". Ph.D. diss. Cambridge: Harvard University. Sholl, Robert (2008). Messiaen Studies. Cambridge & New York: Cambridge University Press. ISBN 978-0-521-83981-5. Simeone, Nigel (2004). "'Chez Messiaen, tout est priére': Messiaen's Appointment at the Trinité". The Musical Times 145, no. 1889 (Winter): 36–53. Simeone, Nigel (2008). "Messiaen, Koussevitzky and the USA". The Musical Times 149, no. 1905 (Winter): 25–44. Waumsley, Stuart (1975). The Organ Music of Olivier Messiaen (New ed.). Paris: Alphonse Leduc. OCLC 2911308; LCCN 77-457244. Zheng, Zhong (2004). A Study of Messiaen's Solo Piano Works. Ph.D. diss. Hong Kong: The Chinese University of Hong Kong. Apparition of the Eternal Church – Paul Festa's 2006 film about responses of 31 artists to Messiaen's music. 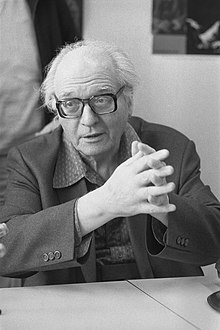 Messiaen at 80 (1988). Directed by Sue Knussen. BFI database entry. Olivier Messiaen et les oiseaux (1973). Directed by Michel Fano and Denise Tual. Olivier Messiaen – The Crystal Liturgy (2007 [DVD release date]). Directed by Olivier Mille. Olivier Messiaen: Works (1991). DVD on which Messiaen performs "Improvisations" on the organ at the Paris Trinity Church. The South Bank Show: Olivier Messiaen: The Music of Faith (1985). Directed by Alan Benson. BFI database entry. ^ (Olivier Messiaen, Nouritza MATOSSIANによる引用, Iannis Xenakis, Paris, Fayard, 1981, p. 58).